As we all know, Australia is entirely peopled by criminals. And drop bears. And drop bear criminals. It's that last one that sort of is what Karnivore Koala is all about. 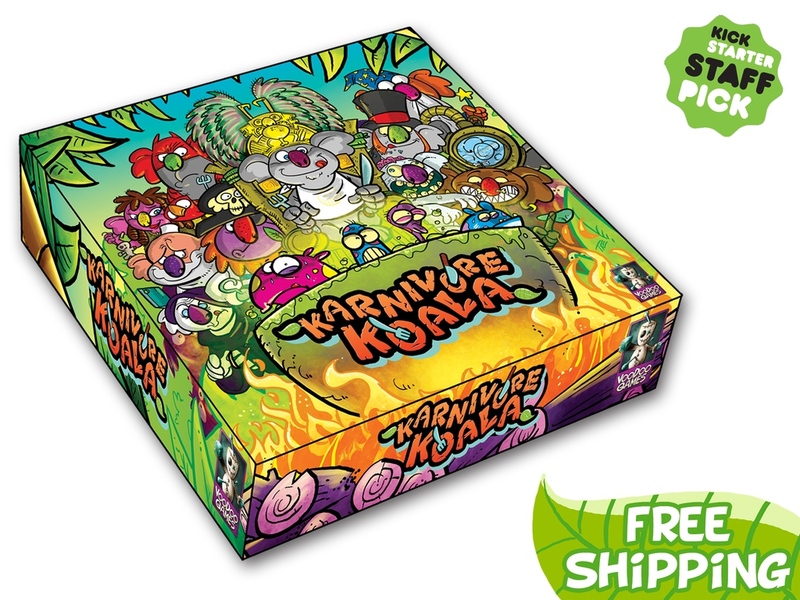 Karnivore Koala is a new card game by Voodoo Games that's up on Kickstarter now and looking for some funding love. And who doesn't love cuddly koala bears? Well, they may not be so cuddly when they're out hunting for fresh meat to eat. In Karnivore Koala, players are in charge of a tribe of koalas in a post-eucalyptus world where koala bears are now exclusively meat eaters. You must play your various tribe members and then roll dice to see if you can go out and hunt tonight's dinner. There are 3 courses to hunt, in the form of appetizer, main course, and dessert. But you have to be careful, as your opponents are hungry for the same items, and they're going to be trying to keep you from getting fed. You have to keep your bears from starving. The standard box comes with 24 Workbear cards, 24 Villagebear cards, 6 Koala King cards, 14 Animal cards, 16 Huntbear cards, 24 Backstabbear cards, 5 dice, and rulebook. They're also offering free shipping on all games, no matter where you live. The campaign has already passed their funding goal and still has 30 days to go.